The Amzer Grey Jelly Case is made out of 100% premium silicone and is a great, light-weight option for protecting your Samsung/Google Nexus S. The durable silicone absorbs any shock your Samsung/Google Nexus S may receive from any accidental drops or bumps, keeping it just like new. The smooth silicone gives you a sure and lasting grip on your Samsung/Google Nexus S and minimizes sliding on flat surfaces. You have full access to your Samsung/Google Nexus S without removing it from the case. The Amzer Maroon Red Jelly Case is made out of 100% premium silicone and is a great, light-weight option for protecting your Samsung/Google Nexus S. The durable silicone absorbs any shock your Samsung/Google Nexus S may receive from any accidental drops or bumps, keeping it just like new. The smooth silicone gives you a sure and lasting grip on your Samsung/Google Nexus S and minimizes sliding on flat surfaces. The Amzer Black Jelly Case is made out of 100% premium silicone and is a great, light-weight option for protecting your Samsung/Google Nexus S. The durable silicone absorbs any shock your Samsung/Google Nexus S may receive from any accidental drops or bumps, keeping it just like new. The smooth silicone gives you a sure and lasting grip on your Samsung/Google Nexus S and minimizes sliding on flat surfaces. You have full access to your Samsung/Google Nexus S without removing the case. 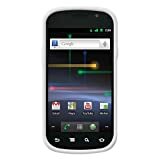 The Amzer Transparent White Jelly Case is made out of 100% premium silicone and is a great, light-weight option for protecting your Samsung/Google Nexus S. The durable silicone absorbs any shock your Samsung/Google Nexus S may receive from any accidental drops or bumps, keeping it just like new. The smooth silicone gives you a sure and lasting grip on your Samsung/Google Nexus S and minimizes sliding on flat surfaces. You have full access to your Google Nexus S without removing the case.